Regular readers won't be surprised at the Bloomberg headline, "How local governments got burned by private prison investments" (Oct. 1). But this graphic demonstrates in macro a story Grits has detailed at the micro-level around Texas. The Bloomberg story details how "The IRS is going after counties that issued tax-free bonds to build jails used by federal agencies, which should have commissioners in several Texas counties shaking in their boots. 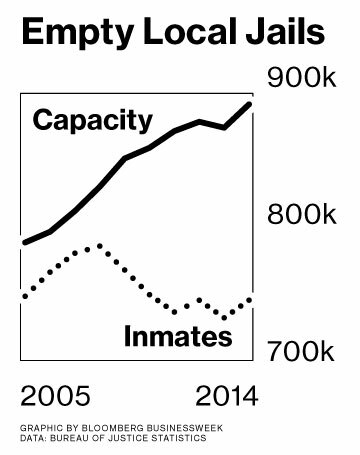 Texas jails have even more spare capacity than depicted in this chart, with 30 percent of beds empty as of Aug. 1, 2015. It's about time that the powers that be learn that just because you build it, doesn't mean they will come. Another example of the private prison industry using some arm twisting methods to get their own way and leave the counties on the hook. There has been such a fanaticism towards the privatization of everything in this country. The privatization of prisons and jails are the worst. They're they modern day slave plantations. Privatization + Prisons/Jails = A race to the bottom. Privatization provides incentives for more incarceration. States guarantee a certain level of occupancy. If you build it, we will make sure they come.